A romp through the park. A splash in the pond. Or even a simple case of the zoomies. What do all of these things have in common? They could all result in a minor cut, abrasion or laceration on your pet. Thankfully, not all accidents result in emergencies and most minor injuries can be safely treated at home. Please be aware, a pet's nails, pads of their feet, face and mouth will bleed more than other areas of the body. That said, if a pet is showing signs of confusion, difficulty standing or is heavily bleeding, get the pet into emergency care immediately. If a pet parent is unsure, always err on the side of caution and get the pet to a veterinarian. Better safe than sorry when it comes to our furry family members. Step 1: Muzzle the pet. I realize most pet parents will be shaking their head right now but even the most docile pet can react out of pain. Most likely, pet parents will be feeling some stress from seeing their pet injured and the pet will be reacting to their owner's stress, along with their own stress and pain. Attempting to handle an injured pet in that state is a cocktail for a bite from a pet that normally wouldn't. Step 2: Access the situation. Pet parents know their pets and can fairly easily tell the difference between an emergency and a minor injury. Is the pet showing any signs of distress? Heavily bleeding? Crying out in pain? Are there possible deeper injuries to muscles, tendons, vessels, nerves, bones and organs? If so, stabilize the pet and transport them to a local veterinarian or local animal hospital. Begin by placing a clean piece of gauze over the wound and apply pressure to the bleeding site. If your pet is bleeding heavily or the blood is soaking the gauze, try using a sanitary napkin (maxi pad), elevate the area if possible. Don't disturb the wound by continuously lifting the gauze/sanitary napkin. If the wound is from a bite or scratch from another animal, make your veterinarian aware, as these types of wounds are very susceptible to infection. If a pet parent suspects your pet has a fractured or broken bone, immobilize the limb as it is found. Find something that will function as a splint such as a piece of wood, rolled up magazine or newspaper. Carefully place the splint under the injured limb. Begin applying the rolled gauze just above the injured joint and continue wrapping until splint is securely in place. ** Be careful not to wrap too tightly. If your pet is NOT showing signs of a serious injury but has a superficial injury to the outer layer of a pet's skin, such as a simple cut or abrasion, a pet parent can safely treat the pet at home. Step 3: If the pet is bleeding, apply pressure to the wound until the bleeding stops. Clean the area with water and mild soap. If the area is covered in heavy and/or long fur, trim back the hair to skin level – making sure not to go over the injured area. Electric clippers are the safest options, but blunt end scissors or a disposable razor can work in a pinch. Pat away excess water with a clean, dry cloth. Check the area for debris of any kind such as a splinter, gravel or glass. If debris is noticed and NOT deeply embedded, gently remove it with a pair of tweezers or needle nose pliers. Never dig out deeply embedded debris, doing so could cause more injury to the pet. Instead consult a veterinarian. Apply a triple antibiotic ointment, such as Neosporin or bacitracin to the wound and prevent the pet from licking it off for at least 10 minutes or longer. 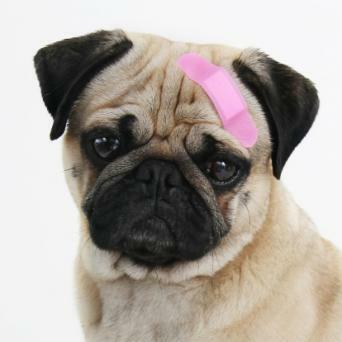 If the pet simply won't leave the ointment alone, a very loose bandage can be applied until the ointment has absorbed and penetrated the wound. Continue to check on the area two to three times a day, cleaning away any debris or seepage and reapply the antiseptic ointment until the wound has healed. Never pick at a healing wound or pull of a scab. Don't allow the pet to lick, chew or scratch at the area while it's healing. A healing wound can be itchy, and before resorting to a collar, try keeping the area around the wound, NOT the wound, moist with a very thin layer of Vaseline. Keeping a healing wound too moist can result in infection. If the Vaseline doesn't work, an Elizabethan collar aka The Cone of Shame or an inflatable collar can be used while the injury is healing. If the wound worsens at any time, shows signs of pus or infection or fails to heal, consult a veterinarian. Pets look to their owners to take care of them and to react calmly and wisely. If an owner becomes anxious or stressed, the pet will react in the same way. Yes, it can be difficult seeing your family member injured, but the best thing a pet parent can do for their pet is to remain calm and have knowledge of emergency procedures and basic first aid.